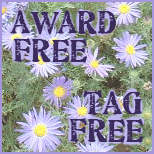 I have two granddaughters who turned one in May. Neither one got a quilt when they were babies so I decided to make them one now. This is the quilt that I made for Esme. I got the inspiration from a quilt I saw on the internet called One Big Cabin by Row House Creations. This is how the raccoon started out. After making the owl sitting on the tree branch and the beaver with the logs and branch over his head, this little raccoon looked a bit lonely. I was thinking of adding a garbage can beside him but decided in the end to just make a little tree stump to blend in with the other blocks. I had fun picking out the fabrics for this little owl. This beaver is not part of the original pattern. 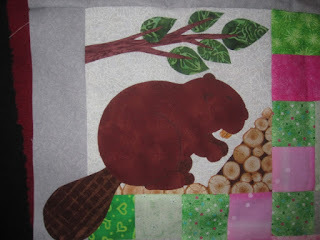 I didn't like the squirrel and since the beaver is Canada's official animal, I thought it appropriate to add him. I also had the log fabric and thought it was perfect so this whole block is my own idea. The beaver was something I found on the internet. Did you know that the beaver's teeth are actually sort of orange in colour? I didn't know that until I read a bit about the rodents. I still haven't put a label on it but I will since this quilt will be in a quilt show in September. I have already added a hanging sleeve. 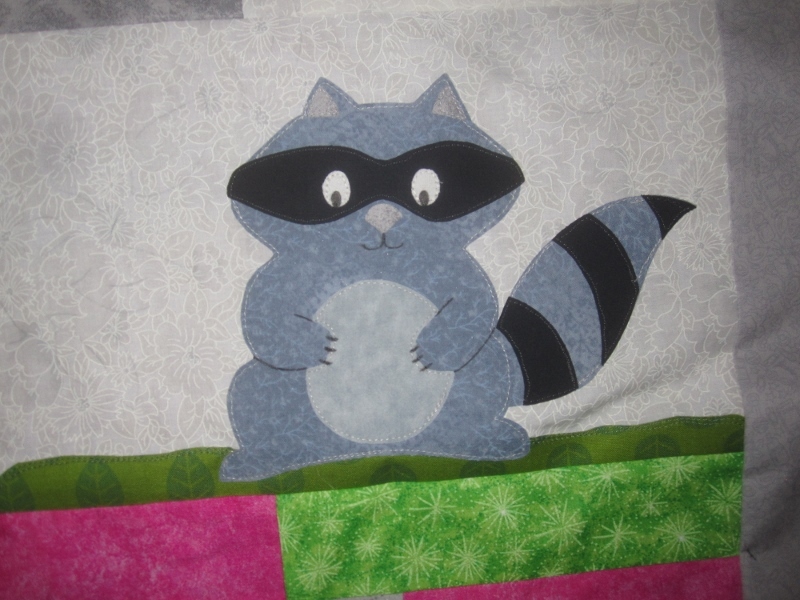 The other quilt for the second May baby, Darcy, is in the planning stage. Oh golly I LOVE this, Dolores!! I love the beaver best of all, and the fabric is so perfect! You are brilliant, I hope you win an award for this in the quilt show!!! Cute! i love the beaver. 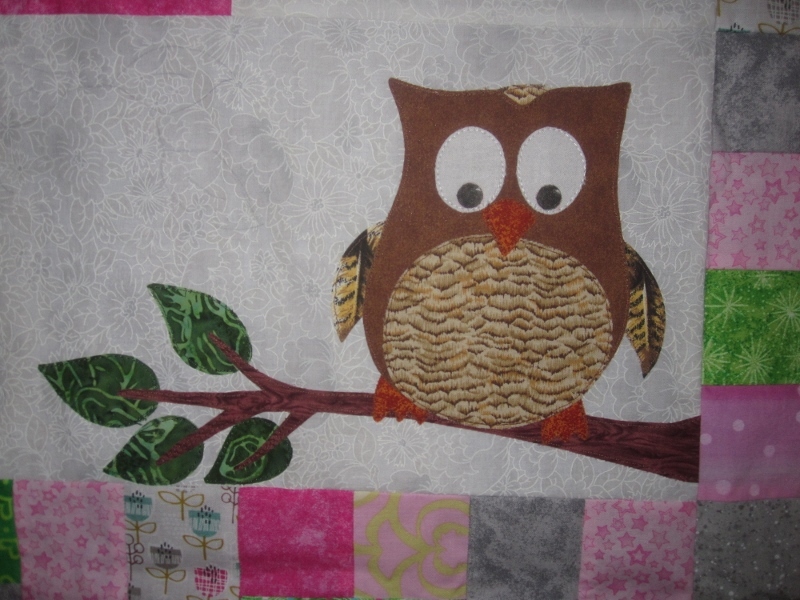 Log fabric, perfect for him to perch on, and with an owl, so lovely. 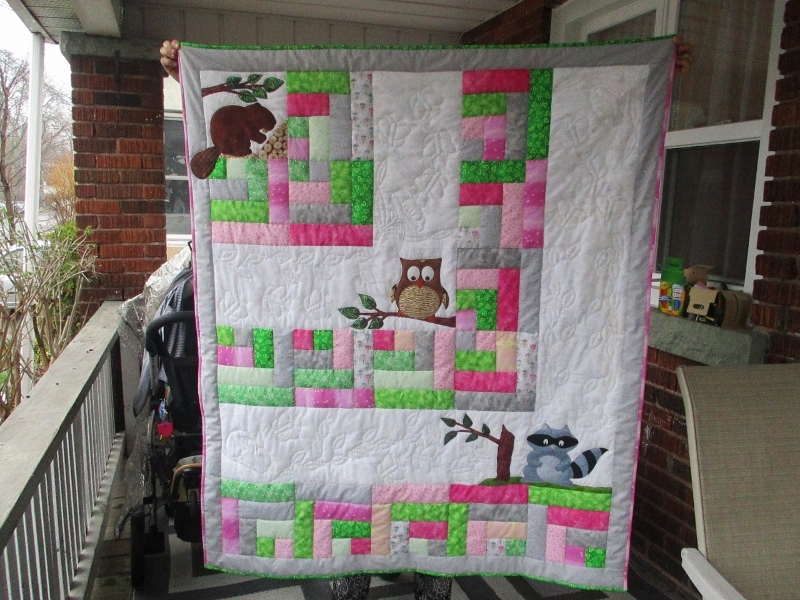 Lovely quilt, and your own designs make it unique and personal for her. awwwww - so cute!!! Those animals are absolutely adorable and the colours you used are so feminine without being sugar sweet. That is a really cute quilt Dolores. In which show are you entering it? Boy, sewing for all your grandchildren really keeps you busy.